Football Charity Challenge – Week 3 ! 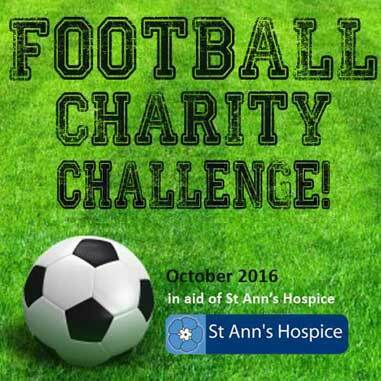 We are now well in to our third week of the Football Charity Challenge in aid of the amazing charity, St Anne’s Hospice. This football project has been set up in aid of the St Ann’s Hospice Accumulator Challenge which involves groups being given £100 to turn into as much as possible over a month, all money raised will help local people who receive care and support from St Ann’s Hospice. At the start of the month we asked you to commit a sum of money for every goal that Manchester United score over the 31 days of October, and that Manchester City concede in the listed fixtures. The fixture list is below and as you can see there have been some very interesting games in there so far, and it is not over yet! The next 7 days see Manchester City take on Everton on Saturday 15th and Manchester United tackle Liverpool on Monday 17th – things are certainly heating up. So please give as little or as much as you can – it is all for an incredible cause.